The massive Khimsar Fort was built in the 16th century by Rao Karamsiji, the 8th son of Rao Jodha, the founder of Jodhpur. 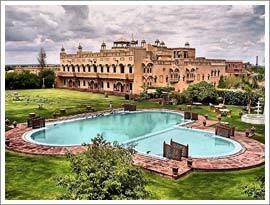 It is located in Khimsar, Rajasthan. Its construction had a very serious purpose to it. It was constructed for fighting battles and for self security. Yellow sandstone was used for building this fort. Now the fort has been transformed into a luxurious heritage hotel. It is an impressive marvel of Rajasthani architecture. The heritage hotel belongs to the Welcome Heritage Group of Hotels and is well maintained. The doors of the rooms of the heritage hotel open into finely manicured gardens covering an area of around 11 acres. The traditional ornamentation of the interiors of the hotel gives you a glimpse of the royal past. The hotel has 50 guest rooms which are well furnished. The room facilities provided are attached bathroom, running hot and cold water, TV with satellite channels, AC, telephone, refrigerator, shower, hair dryer, mini bar and room service. The hotel also provides huge conference hall and banquets for business purposes. In the restaurant of the hotel you can relish different kinds of cuisines such as Indian, Chinese, Continental and the tempting Rajasthani. The various entertaining options available at Khimsar fort hotel are swimming, table tennis, camel safaris, Yoga and meditation, astrologer, puppet shows, massage, spa, steam bath, beauty saloon, horse riding and dance and music performances. Here you do not have to worry about anything as the hotel provides all the modern facilities required for a comfortable and pleasurable stay.